In August 1882 in Incheon Bay near Seoul, four Japanese warships were locked in a tense stand-off with two Chinese warships that had brought troops to quell a revolt on the Korean peninsula. On paper, the Japanese flotilla outnumbered the Chinese, but the hulls of the Japanese ships hid a deadly secret. Less than half of their crews could man their stations. The Korean peninsula erupted into conflict on July 23. A soldiers’ protest against ill treatment, unpaid wages and poor provisions turned into widespread mutiny. Ousted from power, the former regent of the king set the mutineers upon the government—and against the Japanese advisers working to modernize the Korean army. Korean soldiers cornered the chief military adviser in his quarters and stabbed him to death. Another 3,000 mutineers attacked the Japanese Legation. The ambassador ordered his men to burn down the compound and then led his staff to a nearby harbor where they caught a ferry to Incheon. In lashing rain, the rebels chased the Japanese all the way to the port, killing six and wounding five. The roughly two dozen survivors boarded a small boat and cast off. The next morning, the British sloop HMS Flying Fish spotted the row boat and carried the refugees to Nagasaki. It was a humiliating blow, but the Japanese were not gone for long. The ambassador soon returned to Seoul. This time he had backup. Four warships sailed alongside to ensure the safe arrival of the ambassador’s government schooner. As ground forces led the ambassador back to Seoul, Kongo, Nisshin, Hiei and Seiki anchored in Incheon Bay. Two Chinese ships also sailed into Incheon at the request of the Korean king. Tensions between Japan, China and Korea were at an all-time high. Japan was East Asia’s first modern imperialist nation and its neighbors felt threatened by its new ways. Unknown to the Chinese and Koreans, the Japanese ships were running far below fighting strength. Disease struck down 195 of Kongo’s 330 sailors. Similarly Hiei was down to a third of her regular strength, and Nisshin and Kiyoteru weren’t faring much better. The sailors were lethargic, sluggish and—at worst—paralyzed. There was no one to relieve them. The warship Fusou—designated to reinforce the mission—was in terrible shape back in Tokyo. The same disease had debilitated 180 of its 309 crew. Sixteen per cent of all disease and injury in the Imperial Japanese Navy in 1882 stemmed from this one sickness. Beriberi. It was a great shame on the nation that one young doctor hoped to cure. Beriberi—kakke in Japanese—affected all levels of Japanese society, but it became especially prevalent among the urban residents of Edo, the classic name for Tokyo. The disease became known as the “Edo sickness.” Art from the period shows men in wheelchairs afflicted with beriberi. At the time, the causes of the disease were unknown. It became the subject of great debate among Western medical personnel in Japan. Basil Hall Chamberlain, a preeminent Japanologist, demonstrated the lack of understanding of the disease’s causes in his 1890 Things Japanese: Being Notes on Various Subjects Connected with Japan. “In favor of this latter view is to be set the consideration that the peasantry, who often cannot afford either rice or fish, and have to eat barley or millet instead, suffer much less than the townsfolk,” Chamberlain continued. But the disease wasn’t contagious. We now know that beriberi stems from a lack of vitamin B1, which the body requires for metabolizing carbohydrates and maintaining neurological functions. Without it, a person succumbs to nerve damage and eventually death. The source of the deficiency was the urban diet. Much of the poor countryside ate a combination of millet and brown rice, which retained their protein-rich husks. However, in the cities, husked and polished white rice had taken over. Easier to store, cook and eat, white rice was a sign of affluence. Traditional medicine already had remedies for the disease—buckwheat, barley rice, or azuki beans supplied inadvertent boosts of vitamin B1. But “modern” Japan increasingly saw traditional medicine as archaic. Modern assumptions suggested a bacterial or viral cause. One man found challenging these assumptions an uphill battle. 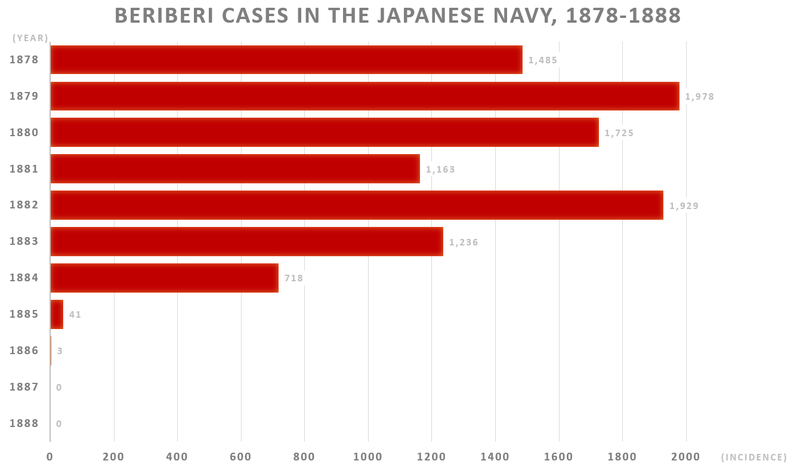 Beriberi was endemic in the Imperial Japanese Navy. Between 1878 and 1883, the disease incapacitated a third of sailors, on average. Beriberi cases made up almost half of all recorded injuries and disease in the fleet. Yet by 1886, beriberi was gone from the navy. All thanks to Kanehiro Takaki. The son of a poor Satsuma samurai family, Takaki was inspired to study medicine by his village Chinese-medicine practitioner. Takaki studied medicine starting in 1866 and, in 1868, answered the call for medical officers to support the Boshin War. It was a revolutionary period in Japanese history. The West’s opening of Japan’s ports in 1853 spurred Tokyo to modernize. Unhappy with the Shogunate government’s handling of foreign influences, the Satsuma and Choshu domains strove to restore the young Meiji Emperor. This led to a civil war between the allies of the imperial court and those of the Shogunate. Britain had close ties to the pro-Emperor Satsuma domain. The Imperial forces needed Western medical expertise on the battlefield. William Willis, one of the two physicians at the Legation, found himself running a field hospital at Yogenin Temple in Kyoto. The efficacy of Western doctors such as William Willis made an impression on the young Takaki. Willis treated hundreds of patients as the fighting spread north—all while revolutionizing wartime medicine. He introduced female nurses and emphasized the need to treat opposition casualties. Willis’ abilities, knowledge and humanity secured him the post-war presidency of the leading medical institution in Japan, the Tokyo Medical School. But his tenure was short. The Japanese elites decided to follow German medical practices—an authoritative, empirical approach where the patient was more of a test subject than a human being. Willis lost his job and moved to Satsuma territory in modern-day Kagoshima. Their close ties with the British and their first-hand experience of Willis’ methods led the Satsuma to create their own school under Willis. Takaki was the school’s first student. He picked up English and acted as teaching assistant and translator during his studies. Willis pushed Takaki to study abroad. There wasn’t enough money in Satsuma to fund the young doctor’s passage and board. There was just one way Takaki could afford to travel. He joined the beriberi-riddled navy in April 1872. Takaki immediately made note of the debilitating effects of beriberi on the fleet. Every few months, around a quarter of its sailors came down with the disease. But why didn’t the British, French and Americans suffer from beriberi? The main reason that the Western navies didn’t have a problem with beriberi was that their sailors ate a balanced diet that included the bran from cereals. This supplied enough vitamin B1 to sustain them. But Western navies had suffered from their own nutritional problems for many years. Until the 18th century, scurvy was a regular affliction for British crews. The disease causes lethargy and depression, along with seeping sores and partial immobility. Unknown to doctors at the time, scurvy also results from a lack of vitamins—primarily vitamin C, which the body needs to synthesize collagen. Navies had experimented with the provision of citrus fruits. It was the experience of HMS Suffolk which turned the tide. In 1794, she embarked on a 23-week non-stop voyage to India … and returned with a healthy crew. In June 1875, 26-year old Takaki traveled to London to attend St. Thomas’s Hospital Medical School. Over the next five years, he learned medicine on a level that would have been impossible back in Japan. This included exposure to the Royal Navy’s battle with scurvy—a struggle that presaged Takaki’s own campaign against beriberi. The key to addressing the beriberi problem was a change in thinking. Japan was firmly in the thralls of German laboratory-based empiricism, but Takaki had returned from Britain with a different method: epidemiology. As a discipline, even as a concept, epidemiology—the medical study of patterns—didn’t yet exist in Japan. But it was the cornerstone of British medicine. Takaki returned to Japan in November 1880, and soon became director of the Tokyo Naval Hospital. The navy was growing but the beriberi problem was as bad as ever. There were so many patients in the summer that they overflowed the hospitals and had to be carted into nearby temples. Takaki resolved to end the crisis. “If the cause of this condition is discovered by someone outside of Japan, it would be dishonorable,” he told the emperor. The Naval Medical Bureau had only collected the most basic of statistics between 1872 and 1877—treatment results, lists of known diseases and the names of hospitalized patients. From 1878, practitioners added facts about non-hospitalized patients and hygiene, but it wasn’t until 1884 that a truly holistic approach to record-keeping took hold. There wasn’t enough data for Takaki to really investigate the disease, so he started from zero. In February 1882, Takaki became vice-director of the Naval Medical Bureau. He was now in a position to investigate beriberi in the fleet. He compiled everything he knew about the disease. Beriberi was more prevalent at the end of spring to summer, but occurred at some level throughout the year. It affected both ships and bases, skipping some units entirely. And the state of quarters and clothing seemed to have no impact on the disease. Looking more broadly, Takaki noted that sailors from higher social classes rarely came down with beriberi. The disease mainly struck large cities … smaller towns sporadically. Takaki rejected Western doctors’ hypothesis that beriberi resulted from “high temperature, moisture, marshy air, over-crowding, hard labors, nervous exhaustion, coarse food, etc.” All navies had to contend with these conditions, but the beriberi problem was seemingly unique to the Japanese. Takaki began to suspect the navy diet. He petitioned the navy ministry to give him a broad remit to investigate the problem—but the navy was skeptical. The German-trained doctors at the elite Tokyo Imperial University all pointed to a microbiological cause. Falling back on his Satsuma connections, Takaki finally managed to persuade the ministry to approve an investigation into the navy’s great shame. Takaki surveyed living conditions, including the length of the workday, sanitation, clothing and diet. In the data he spotted a “great deal of difference” in sailors’ eating habits. Cross-referencing similar British studies, he finally pinpointed the culprit—protein deficiency. Sailors were consuming too many carbohydrates. Earlier German research had demonstrated that a healthy diet required at least one unit of protein per 15 units of carbohydrates. By contrast, the average Japanese sailor ate one unit of protein per 28 units of carbs. “The greater the difference in these proportions the more beriberi occurred, and the lesser the difference the less,” Takaki noted. He had cracked the beriberi secret. To improve the health of its men, the Imperial Japanese Navy simply had to ensure they ate better. But the navy was having none of it. Officers recalled the unrest that had hit the Italian navy after a change of diet—and they defended the current money-based system. Under this system, ships’ crews were required to buy their food from the galley. Only white rice was free. Officers had the money to afford a more nutritious diet while sailors frequently resorted to surviving just on the free rice. Takaki fought hard to institute fixed diets—but the navy resisted, saying it would double the cost of feeding crews. The telegram was from Ryujo, a Japanese naval vessel on a training cruise around the Pacific Rim. Ryujo eventually returned from her voyage with 25 dead sailors on her manifest. Forty-five percent of her 376-strong crew had developed beriberi. It sent a shock through the Ministry of the Navy … and all eyes turned to Takaki. He asked the navy to give him control of the diet aboard Tsukuba, another vessel about to set out on a training voyage. He demanded the Tsukuba follow the same route as Ryujo to minimize the variables of time and location. Takaki asked his fellow Satsuma statesmen to secure Imperial backing. He met with the emperor and explained his theory. “We must investigate the cause of this disease, and if we should succeed in preventing this condition it would be a great honor for the Japanese people,” Takaki said. With Imperial assent and money from the Ministry of Finance, Takaki assigned Tsukuba a simple set of rules to ensure that sailors kept to a 1:15 ratio of protein to carbohydrates. The navy ministry formalized the new food system on Nov. 29, 1883, and Takaki issued a detailed handbook to the fleet in February 1884. Tsukuba set out on Feb. 2, 1884. Takaki was uneasy. He had promised the emperor success—his life was on the line. “I would have immediately committed harakiri, begging pardon for the great mistake,” he said when asked what he would have done in the event of failure. But Takaki needn’t have worried. A telegram followed in September. “Not one patient; set your mind at ease.” The ship returned on Nov. 16 with incredible results reminiscent of the British success with the HMS Suffolk. Only 14 of the 333 sailors aboard the Tsukuba had suffered from beriberi. Those 14 had not been eating their food rations properly. Tsukuba’s voyage cemented support for Takaki throughout the navy. Within one year, the incidence of beriberi dropped by 94 percent and deaths from the disease ceased. Takaki had also improved the general health of the fleet. Better-nourished crews were suffering from 50-percent less overall disease and injury. Takaki had identified the nutritional causes of beriberi and reduced the disease significantly, but some sailors were still succumbing. The reason—finicky eating and socially-constructed ideas of “good” food. The navy gave sailors bread and biscuits to boost the protein in their diets. Rumors spread that the sailors only had to eat the soft doughy parts of the bread to improve their health, and so many sailors threw the crust overboard, luring flocks of seagulls to the ships … and sending Takaki back to the drawing board. In March 1885, he instituted his solution—protein-rich barley mixed with rice. Many of the enlisted personnel in the navy came from the lowest strata of Japanese society. They grew up in poor villages on a diet of brown rice and millet. Too poor to eat fish and vegetables, the highest they could aspire to was the all-you-can-eat polished white rice of the navy and army. These sailors resisted a return to a poor man’s diet. But Takaki also faced severe criticism from army doctors and academics. The Japanese Imperial Army—with its close ties to the Prussian army and German-style medical practice—continued to believe beriberi was an infectious disease even after Takaki’s successes. For thousands of years, diseases had been seen through the lens of kampo, traditional Chinese herbal medicine. In kampo, disease was caused by heat or evils and was treated with herbal remedies. Sometimes the medicine was hokey, but other times it worked—as was the case with azuki and barley supplements for beriberi. But many Japanese now viewed kampo as backward and even shameful. Likewise, they considered Takaki’s prescription archaic nonsense, owing to its kampo roots. 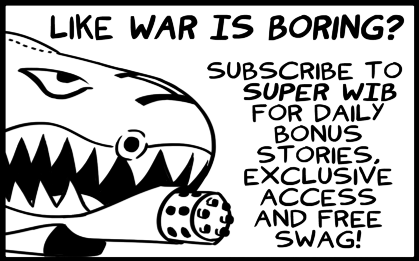 Takaki’s statistical claims sometimes fell on deaf ears. The establishment was more comfortable with laboratory experiments and cold detachment from the human element of medicine. Takaki’s success, they argued, was due to the sanitation benefits of living on a warship, where everything could be disinfected. Sanitation, white rice, experimental medicine—this is what it meant to be modern in Meiji-era Japan. “Since it is so widespread in the army, the urgent matter at hand for military physicians is to research, prevent and treat this illness,” Ishiguro added. But the army dealt with its beriberi problem very differently than the navy did. The ground branch’s insistence on a microbiological cause led it to focus on sanitation—but all the sanitation in the world wouldn’t give their soldiers the dose of vitamin B1 they needed to survive. The answer was so plain to see that the solution to the army’s beriberi problem actually developed from the bottom-up. Civilian prisons had been mixing barley with rice since 1875. Toshikuni Horiuchi, chief medical officer of the Army’s 4th Division in Osaka, was initially skeptical of Takaki’s successes, but took interest in the exceptional changes brought on by adding barley to the diets of prisoners. After petitioning his commanding officer, in autumn 1885 Horiuchi directed the 8th Infantry Regiment to mix barley with its rice. The rest of the 4th Division followed suit by 1886. Other units joined in. Barley and rice became the unofficial diet of much of the army in peacetime. Thanks to the army freeing the hands of its commanding officers, beriberi contraction rates dropped from 26 percent in 1885 to four percent in 1887. The rates stayed below two percent until the First Sino-Japanese War in 1894 and 1895. During the war, the official rice staple overrode the unofficial use of barley. For the duration of the war, the navy was beriberi-free, but the army lost 4,000 soldiers to the disease, with another 41,000 hospitalized. Some individual commanders chose to add barley to their men’s diets, thus saving lives. Stubborn and blind to the truth, the army was marching towards its biggest beriberi disaster ever. Twenty years after Takaki had eradicated beriberi from the navy, Japan faced Russia in the Russo-Japanese War from 1904 to 1905. The army hospitalized 250,000 soldiers with beriberi, 27,000 of whom died. The shocking toll ended the army’s resistance. In the middle of the war in February 1905, Gen. Masatake Terauchi ordered the army to mix barley with its rice. After the war, the Emergency Beriberi Investigative Committee investigated the disease’s devastation of Japanese ranks. Worried about the composition of the committee and fully aware of Takaki’s success, the emperor stepped in. “The army’s beriberi problem can be effectively prevented if the army provides a staple of barley and rice,” the emperor stated. In lectures published by the British Lancet medical journal in 1905, Takaki discussed his battle against the establishment view in a way that the army probably would have understood. “All through these years of hardships, I tried to explain my views to others by comparing the food to gunpowder,” the barley baron explained.